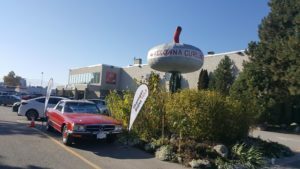 Coaches blog on the past few days in Kelowna at World Mixed Curling Championships. I am happy to be corrected but this may have been Ireland’s first sporting victory since Liam Brady popped one in the net at Landsdowne Road in 1987 (ed: Ireland vs Brazil friendly football match for those not in the know). Things did not start well though and we were quickly down 5-0 after 3 ends. Brazil’s skip could draw anything to the button no matter what was in front of her. Ireland were in trouble. Thankfully a 3 in the 4th end stemmed the tide. Following a ‘wee chat’ at half time and a change in tactics and after Brazil took their 1 in the 5th end Ireland went into overdrive and scored a 3 in the 6th to tie the game 6-6. Ireland went onto steal a 3 in the 7th end and another steal of 1 in the final end to run out comfortable winners despite the rocky start and record Ireland’s first win of the week. Confidence was much higher going into the 8pm games versus The Netherlands. Thankfully the Brazil Coach has agreed to swap his jersey with me at the end of the week. He is of similar build and I was struggling to find an athlete with the same curves!!! A resounding victory on James Russell’s 50th cap for Ireland in 6 ends versus a surprisingly under-performing Netherlands team. Ireland set the tone from the first end with a resounding 6 which appears to be the highest end score in the competition. By half time it was 8-2 and Ireland were in control with good accuracy. 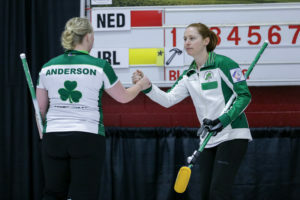 The Netherlands scored a 1 in the 5th end but Ireland closed out the game in the 6th end with a 4 to win 12-3. After a wee drink with a visibly shell shocked Netherlands team it was straight home to bed as undefeated Russia were next at 8am and USA at 4pm. A tough assignment against the world ranked No.2 team that contained some world championship silver medallists. A slightly flattering score line against an emotionless but highly skilled Russian team. One of our objectives was to make them smile and we got one or two smirks out of them. Ireland took the lead with a single in end 1. This rattled the Russians a bit who hit back with a 2 in the second. 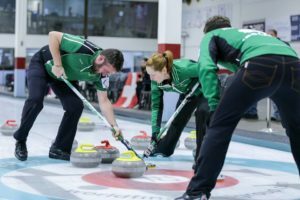 Ireland levelled in the 3rd end but Russia pulled away with a 2 in the 4th end. They thought it was a 3 with one biting the house. The match umpire said it was in but Alisa stuck to her guns and called for a measure. Just out was the result. I blame a ‘dodgy hole’ but we took it and a bit of the so called ‘luck of the Irish’ came our way. However Russia stole a 2 in the fifth to take a 6-2 lead. Ireland dug in and grinded out a single in the 6th. Russia again took a 2 when they had hammer. In the 8th end Russia quickly ran us out of stones and hands were shaken before the end. Ireland played really well against very quality opposition with clear designs on winging the competition. The only real difference was they took twos when they had hammer whilst we took singles. The defeat was softened by the drinks purchased in the bar afterwards by our opponents!!!! This defeat was a combination of many things. Irish fatigue with 4 games in 28 hours and USA finally getting their A game out following 3 consecutive defeats. In addition to this a lack of communication in the first half did not help matters. Ireland trailed by by 3 to 1 at half time but soon became 5-1 after end 5. It could have been a hand shake at end 6 with Ireland lying 3 against before James made a tremendous draw to the 4 foot for a 1. USA took another 1 in end 7 and hands were shaken midway through end 8 once we were run out of stones. “we were an ‘awesome’ team with enough capability to beat them”. I like to think of it as justified respect for Ireland. It was a special occasion for our LA team member KT Kerr playing against her country of birth. 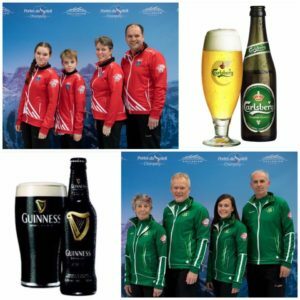 A good time was had by both teams in the bar afterwards before team Ireland and Austria went on the well organised pub crawl arranged by the local committee. Arran and I made it to the small hours and found all the Irish pubs in Kelowna. There are just 2 by the way! News filtered through that morning that Russia were finally beaten. Who were Ireland’s next opponent but the team that beat them, Finland who themselves had aspirations of doing very well in the competition. What a game of high intensity, skilled and sh*t in your pants curling. It was clear from the outset that Finland were quality opposition but Ireland were up for the fight following a chat about improved communication and the importance of good guards from the outset. Finland had to play a perfect hit and roll across to take their 1 in the first end. A blank end in the 2nd meant Ireland retained the hammer. James Russell played a delicate draw to take 1 in the third to tie the game. A poor end in the 4th saw Finland score a 2 and take a 3-1 lead at half time. A positive half time discussion meant Ireland’s going back out firmly believing a win was possible. Ireland reduced the deficit by one in the 5th end which was followed by a blanking the 6th. 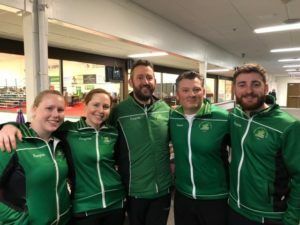 Following some exceptional guards and draws by Katie, Arran, Alisa and James, Ireland stole a very important point to tie the game going down the last. Whilst not having the hammer Ireland looked confident but a mistake by Finland was needed. This came in the very last stone. James had spotted that the Finnish skip was a tad weaker on his outurn and James placed his final stone out wide on the 12 foot and invite Finland to either go for a hit and stick or a draw to an empty 8 foot. He opted to go for the hit and stick but he slid marginally wide and whilst he cleared the Irish stone his slid off to the side and an accidental blank. 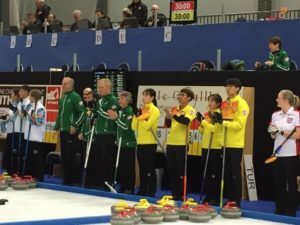 Extra end and by now a huge crowd had gathered as an Irish win had significant implications for Australia and Switzerland. As we were without the hammer again we needed to steal. The following was the sequence of Irish stones – guard, guard, guard, guard, guard, guard, guard and a draw to the 8 foot by James and hidden by numerous guards. The Finnish skip had to draw to the 4 foot for the win. However he slid out light and despite a wee pop, it overcurled and caught an Irish guard leaving Ireland with a momentous win and huge cheers from the USA, Swiss and Aussie teams standing behind me plus the crowd upstairs. An exceptional game of curling by both sides that had everything. I don’t normally get too emotional but a tear was shed afterwards whilst packing up after the game. Finland were understandably gutted as it prevented them from making the play offs but joined us shortly after for a drink and we remain good friends. A wee Irish celebration continued back at the house. Final day of the round robin saw us face Denmark who had already qualified for the play offs and as we were out, it was a dead rubber. It would have been nice to finish with a win but Denmark were too strong and ran out 9-4 winners in 6 ends. 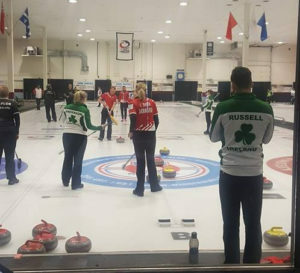 Whilst it may have been a competition of a few could and should haves, Team Ireland performed exceptionally well against high standard opposition in a ‘group of death’ and can hold their heads very high. 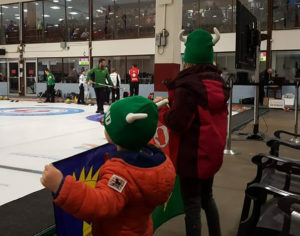 We have made many friends at the competition and the future of Irish Curling looks good. It was certainly my proudest moment in my curling career. 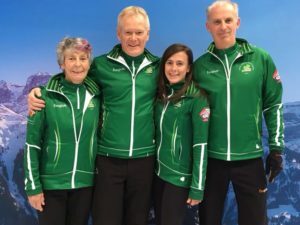 The Irish Mixed team of James Russell, Ailsa Anderson, Arran Cameron, Katie Kerr and coach Steve Callan ended their adventure at the World Mixed Championships in Kelowna, British Columbia, Canada with a defeat to Denmark. 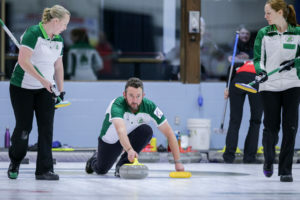 The experienced Danish team got of to a flyer with a three at the first end, followed by a steal of two that effectively put the game out of Ireland’s reach. 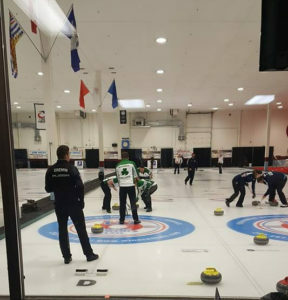 Twos were exchanged until the game was ended before the last end. Russia, Denmark and Switzerland qualify from Ireland’s group for the final stages. 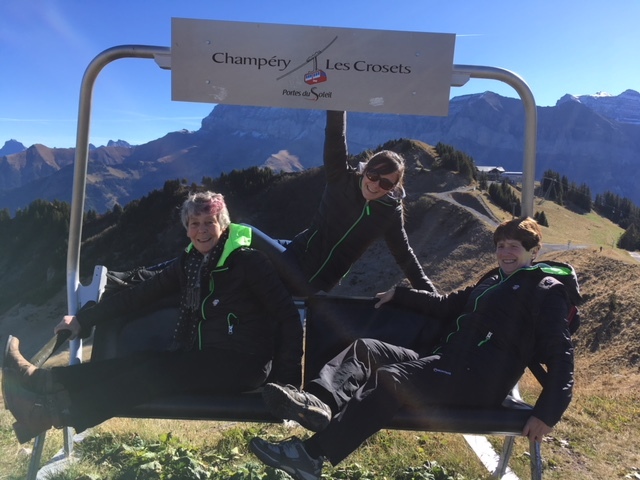 Met with another beautiful day in the Swiss Alps we had the full day to prepare for our 6th game and enjoy the superb weather with temperatures exceeding the nicest of Belfast summer days. 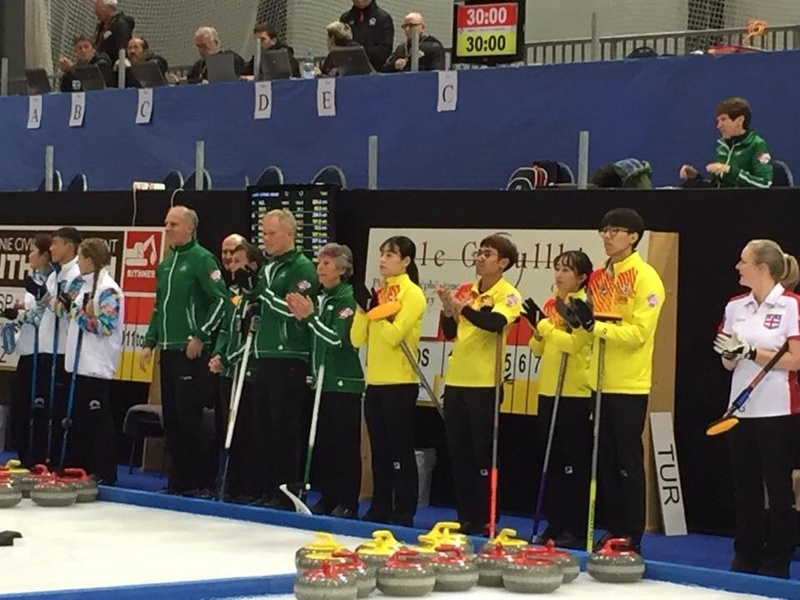 Our opponents today were the young South Korean team who had 5 wins to their name – looking resplendent in their bright yellow team uniforms they exuded confidence from the moment they stepped on the ice. It was soon obvious they had trained to a very high standard and were positioning stones to the nearest mm. Some great 1st end play by Ireland was sadly the highlight of the game and the incessant pressure applied by the Koreans took its toll. We can take comfort that without doubt these young players will be stars of the future. Our team walk back from the rink witnessed another glorious sunset which lifted team spirits and soon brought our trip back into perspective. 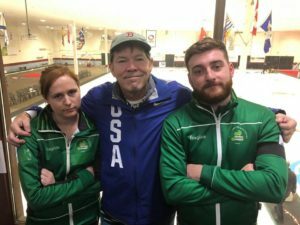 Our 8 am game against Kazakhstan got off a solid start with four players in both teams for the first two ends. The Kazakhstan lead was then banished to the coaches bench where she remained for the rest of the game, as usual. A lead of 6 – 2 was established by mid game break. Hands were shaken during the eighth end when the score line read 7 – 3. 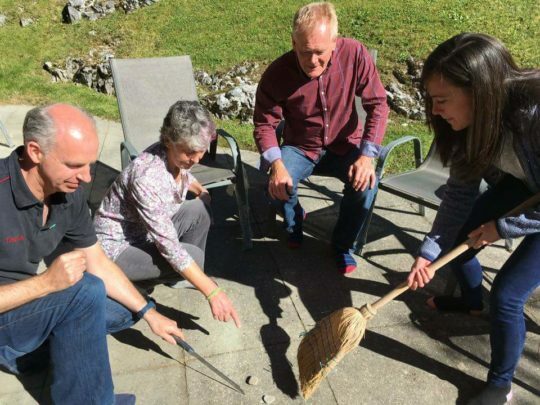 Team Ireland then retired to review stone placement and sweeping tactics on the patio. 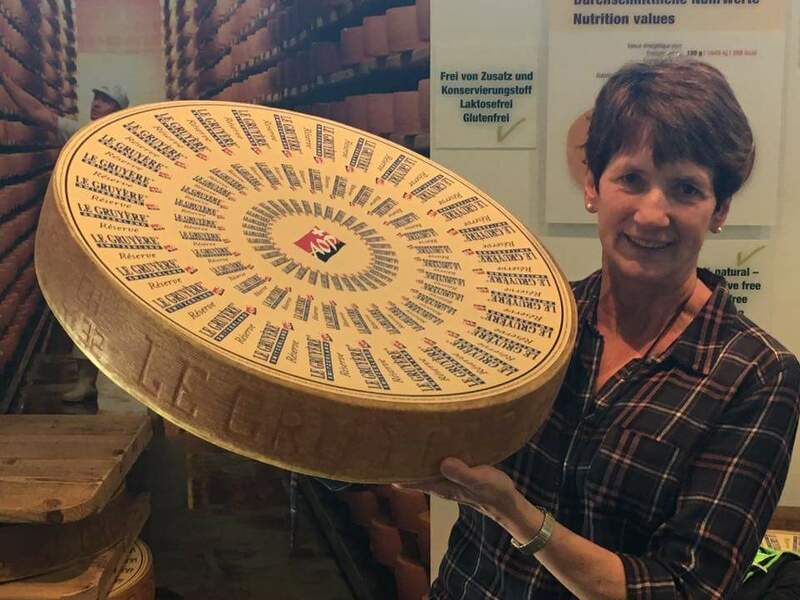 The team decided nutrition needs should be met by a visit to the local Cailler chocolate and Gruyere cheese factory in preparation for the game against Korea. 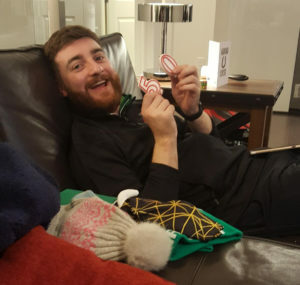 Nothing like keeping things exciting for our dedicated coach! Having decided that our tactics for the Luxembourg game was to avoid having guards, we managed to play the first two ends continually setting up guards and letting Luxembourg draw around them. 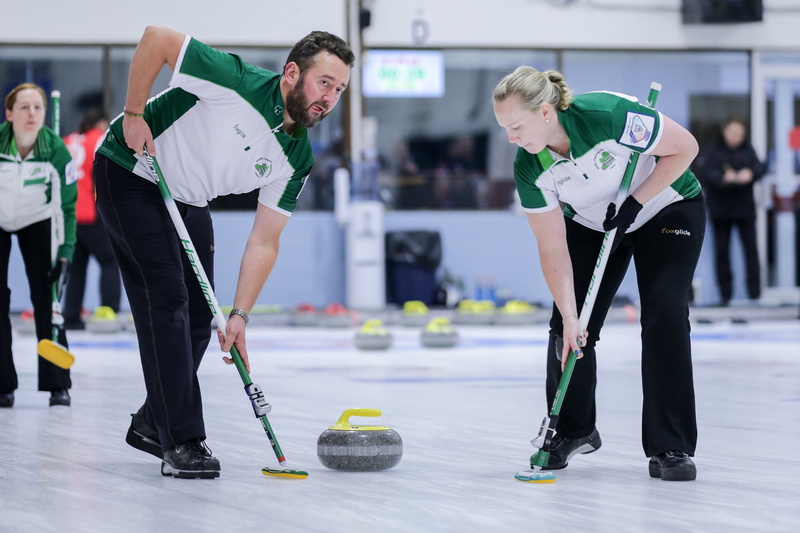 Realising this was not in our game plan, we began to play the intended tactics from end three onwards and we held our own, which resulted in s good win for Team Ireland! An early morning game tomorrow against Kazakhstan – it will be interesting to see if the full opposing team can make it through the whole game with four players. A win for Pure Genius!! 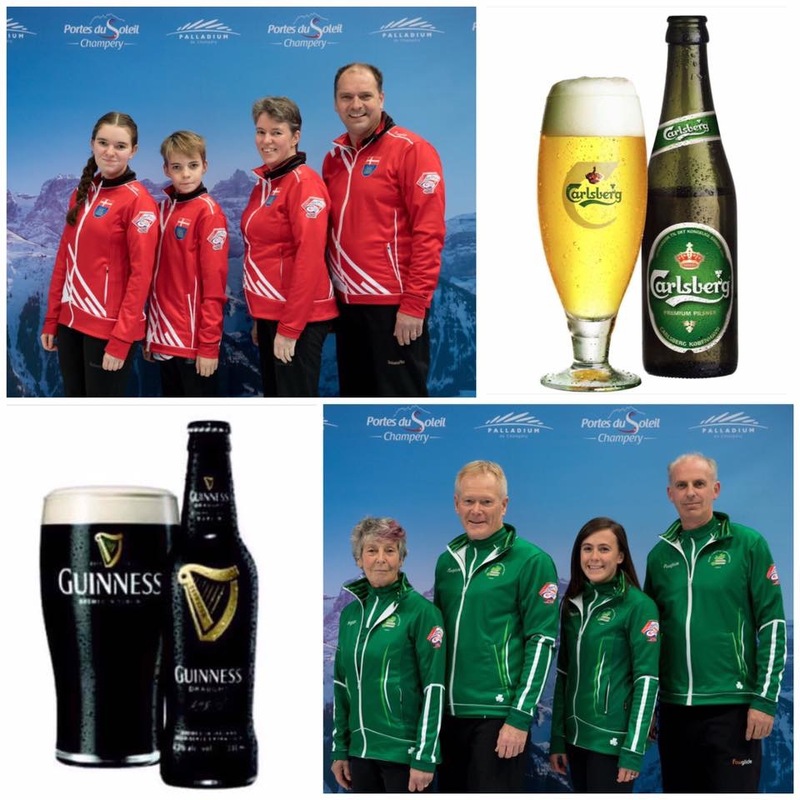 Another exciting day for Team Ireland! An early rise for our game against Scotland. Started off well, but unfortunately out-played by a very strong team. Sociable drinks after helped us to lift our spirits after a tough game. Team Ireland were psyched for the afternoon match. Coming up against Silver Olympic medalist Trine Qvist and well experienced coach and seniors player Mikael Qvist. We knew it was an important game for us. After a good first end we struggled with our weight, leaving us 5-1 down at half time. Regrouping after the break we came back strong and were 6-5 up without the hammer going in to the last end. A tense final end, with a well placed stone nestled on the button allowed us to gain a final point in the eighth end! 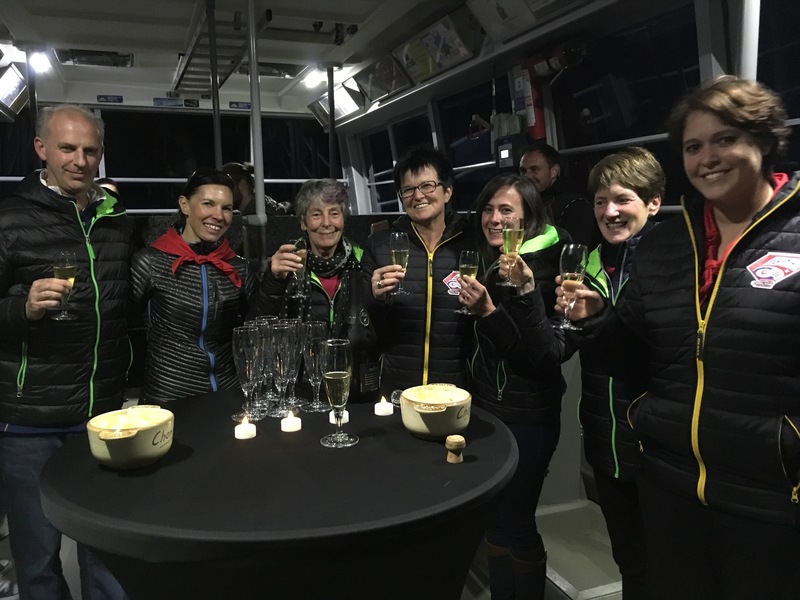 Our day ended with a night excursion up the gonolda with bubbles and snacks; a perfect way to toast our second win of the competition.